The typical bread of the Lombardy region, Michetta is deliciously delicate and simple. 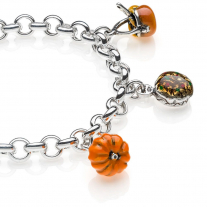 The Michetta bread bracelet is elegant, and perfect for those wanting to wear Lombardy tradition. Always keep it with you! The waxed cotton rope with nautical knots and silver ends, fits all wrist sizes. 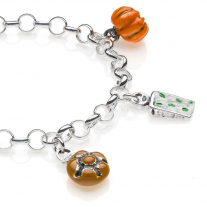 Check out the other bracelets from our Lombardy collection and choose your favorite! Details: Charm bracelet, handmade in Italy. 925 Sterling Silver, hypoallergenic (nickel free). Scratch-resistant enamel. Adjustable Wax Cotton Rope. Every charm is handmade by passionate Italian craftsmen in Tuscany, 2 year guarantee.